McCollum back Mike Ramirez recorded one rushing and one receiving touchdown against the Eagles. AREA TEAMS INCLUDED: Brackenridge, Edison, Lanier, McCollum, Southside, Sam Houston. McCollum (1-2, 1-0) won its first game under first-year coach Greg Felux in impressive fashion, defeating Lanier (0-3, 0-1) 35-19 Sept. 11 in a District 28-5A game at Harlandale Memorial Stadium. The Cowboys showed no signs of wear from a pair of non-district losses to Uvalde and Victoria West. Cowboys quarterback Jordan Ortega ran seven yards for a touchdown and threw 45 yards to senior back Mike Ramirez for a 14-0 advantage with 4:26 left in the first quarter. Lanier freshman Christian Cervantes (52 yards, 7 carries) cut the lead in half 36 seconds before the quarter ended with a 12-yard dash. Two minutes into the third quarter, Lanier was within 21-13 when Julian Castillo hauled in a six-yard pass from Jeremiah Esquivel (13 of 23, 117 yards). Ortega (64 yards, 12 carries) and Ramirez each scored again in the fourth quarter to help McCollum put the game out of reach. Ramirez (110 yards, 16 attempts) reached the end zone with a 52-yard run with 7:31 left. It was his third touchdown. Esquivel connected with Castillo on a 36-yard pass to complete the scoring. Castillo finished with 83 receiving yards and 65 rushing yards. Ortega completed 14 of 24 passes for 218 yards. T.J. Martinez had four catches for 43 yards. The Cardinals (2-1) bounced back from a loss to Sam Houston with 27 unanswered second-half points against Austin Travis (0-3) in a non-district game Sept. 11 at Southside. Southside led by two touchdowns at halftime, but Travis cut the lead to 14-7 just 58 seconds into the second half. The Cardinals had established a 27-7 lead before the third quarter ended. Cardinals junior back Matt Collier rushed 41 times for 294 yards and four touchdowns. Marc Garza completed nine of 12 passes for 72 yards. Erik Luna finished with six receptions for 52 yards. Southside amassed 364 rushing yards and 436 total yards. The Golden Bears (2-1, 1-0) ended a four-game losing streak in their series with Brackenrdge (0-3, 0-1) Sept. 11 in a District 28-5A game at Alamo Stadium. It was Edison’s second-consecutive win. Edison junior Matthew Garcia (109 yards, 25 carries) scored the winning touchdown on a one-yard dive with 2:22 remaining. Garcia also put the Golden Bears in the lead with a 12-yard run with 46 seconds left in the third quarter. The Eagles answered that touchdown with an 11-yard pass from Antonio Lopez (28 of 49, 317 yards) to Johnathan Lucas that made it 28-28 with 9:02 left in the third quarter. Lopez passed for three touchdowns. The senior also ran for a touchdown and a two-point conversion. Edison quarterback Danny Cadena (14 of 21, 165 yards) passed for two touchdowns, throwing 35 yards to Joseph Gutierrez (50 yards, 3 receptions) and 33 yards to Joey Rodriguez (58 yards, 3 receptions). Brandon Olivares caught six passes for 49 yards. Brackenridge’s leading receivers were Jalen Davis (104 yards, 10 receptions), Justin Eaton (90 yards, 3 receptions) and Jonathan King (52 yards, 6 receptions). Tyrus Mathis ran 15 times for 46 yards. 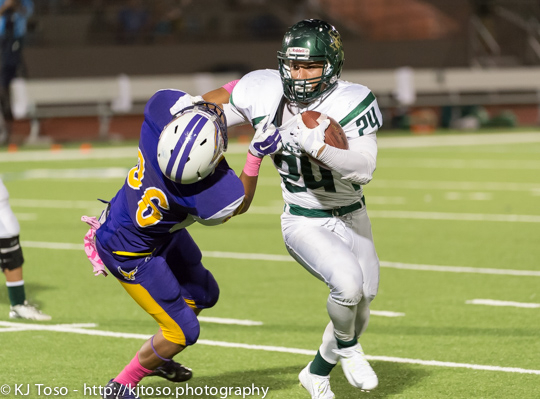 The Hurricanes (3-0, 1-0) smashed Burbank (0-3, 0-1) in its District 28-5A opener Sept. 11 at the SAISD Complex. Sam Houston senior quarterback Raymonte Prime completed 11 of 15 passes for 222 yards and four touchdowns. He also ran for 41 yards on four carries. The Hurricanes scored the first three touchdowns, on passes of 45 yards to Trenton Jones and 11 yards to Jawon Anderson (52 yards, 2 receptions) followed by a 25-yard run from Prime. Anderson also caught a 41-yard touchdown pass in the third quarter. Devin Harris scored on a 50-yard pass play and a two-yard run. Earl Woods (56 yards, 5 attempts) was the Hurricanes’ leading rusher and ran 29 yards for their final touchdown. Dylan Gusme plunged in from the one-yard line with 27 seconds left in the first half for Burbank’s only score. Gusme ran for 45 yards and passed for 40. Rubyn Salazar caught four passes for 41 yards. Sam Houston limited Burbank to 158 total yards while gaining 387. Both teams produced two interceptions.